Today marks the 40th day after the death of Neda Agha Soltan, and protesters are gathering in Tehran to mourn. 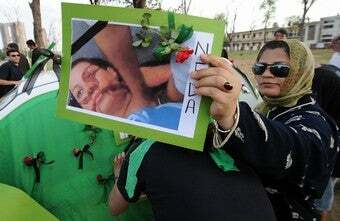 Meanwhile, Neda's mother tells the BBC that "the world sees her as a symbol." The 40th day after a death is significant in Islamic tradition, and 40-day cycles of mourning for martyrs were a key part of the 1979 Iranian Revolution. Today protesters are gathering at Neda's grave and several other locations in Tehran. "At least 2,000" people have come together at a prayer location called the Grand Mosala, despite being denied permission to hold a rally there. Witnesses report that Iranian police are using tear gas, arresting Moussavi supporters, and smashing car windows in an effort to quell the protests. Reportedly among the protesters is Neda's mother, Hajar Rostami Motlagh, who spoke with the BBC in an interview published today. Will Neda Agha-Soltan&apos;s Death Tip Iran Into "Revolution"? It was all about being young and feeling passionate about freedom. She wasn't political. She didn't belong to any party or group. She didn't support any faction. Every other young Iranian was there - and she was one of them. [...] You can't blame young people for going out and wanting to feel free. No, not really. No. I can't tell you if her death has turned me into a political person. I am still in shock. In pain. I can't think about anything except her. knowing that the world cried for [Neda] … that has comforted me. I am proud of her. The world sees her as a symbol, and that makes me happy. Emotionally we are all broken. What can we say to each other? Our loved ones were too young to die… what can three mothers in the same situation say to each other? All we can do is just sit there and cry.